Apple has changed the way we obtain and consume media thanks, in large part, to the iPod. One might reasonably make the case that without the company’s diminutive music player there would be no iPad today. Given the importance of media to Apple and its family of portable products, the iPad’s music and video capabilities deserve a close look. In regard to audio and video, the iPad has more in common with the iPod touch than with the iPhone, in that it consigns each kind of media to its own application—iPod and Videos—rather than ganging the two into a single iPod application (the iPhone’s method). Thanks to the iPad’s greater display space, the iPod app looks more like iTunes on a Mac or Windows PC than it does the iPod touch’s Music app. 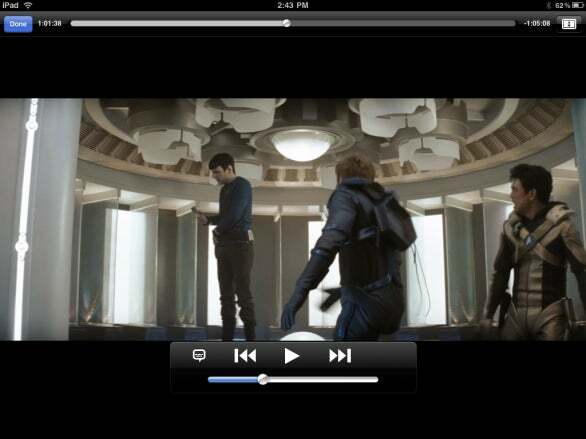 The Videos app is more of a hybrid between iTunes and the touch’s Video app. Similar to iTunes, the iPad’s iPod app sports a source list (labeled Library on the iPad), where you see entries for Music, Podcasts, Audiobooks, iTunes U, Genius Mixes, and smart and standard playlists that you’ve synced to the iPad (and, in the case of standard playlists, those you’ve created on the iPad as well). At the top of the screen are play controls—back/rewind, play/pause, next/fast-forward—as well as a scrubber bar, volume control, and Search field. Using the scrubber bar you can scrub through tracks just as you can on an iPhone or iPod touch. After tapping on the playhead, drag your finger lower down the screen and you have finer control over scrubbing increments. When you select Music or a smart or standard playlist, at the bottom of the display you see Songs, Artists, Albums, and Genres buttons for displaying your tracks in these various views (when you select Music you see an additional Composers button). Unlike with iTunes, you don’t have as many choices about how music is displayed in these views. 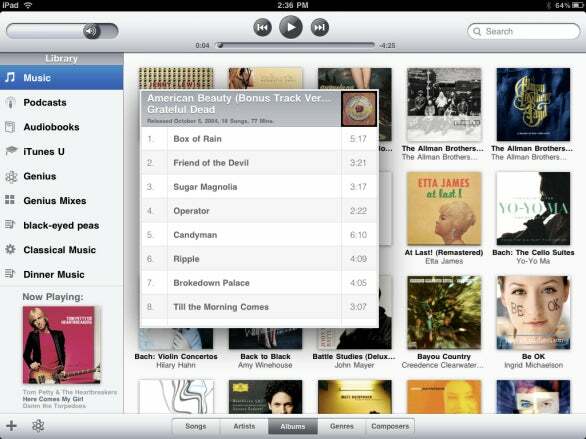 For example, Songs appear in a list view, Artists appear in an alphabetical list with small thumbnail images from an album by that artist, Albums display album covers, Genres uses the same variety of genre artwork used in iTunes, and Composers looks similar to the Artists view—displaying composers in an alphabetical list along with small album artwork thumbnails. To see the contents of an album just tap it and a track list window appears. There’s no Cover Flow view, which seems odd on a touchscreen device with this roomy a display. Tap an album to see its contents. Podcast shows are arranged in a list with thumbnail art. Below the show title is the number of episodes on the iPad. Tap a show and you see a list of episodes. Tap an episode and it plays. Episodes you haven’t played have a black dot next to them. If you’ve listened to part of a podcast, the dot is half-filled. Video podcasts appear both in the Podcasts sections of the iPod app and the Video app. If you have a playlist that include videos, those will appear in the iPod app as well. Audiobooks are presented in a list. Tap an audiobook and a screen appears with chapters listed. Genius mixes display the same four-album-cover collage they do in iTunes. Unlike with iTunes, you don’t have the option to rename Genius mixes or rearrange their position on the iPad’s screen. In the lower-left of the display is a Plus (+) button for creating a new standard playlist on the iPad—you can’t create a smart playlist on an iPad, though it will play smart playlists you’ve created in iTunes. Next to the Plus button is a Genius button for creating a Genius playlist based on the currently playing track. Unlike with iTunes, there’s no Genius recommendations feature within the iPod app. As with the iPhone and iPod touch, if you want to switch on Sound Check (the feature that attempts to balance volume among playing tracks), muck with EQ, or configure a volume limit, you do so from the iPod settings within the iPad’s Settings app. Compare this screen to the iPhone 3GS and current iPod touch and you see it lacks a Shake To Shuffle feature, but does include a switch for allowing or disabling the ability to view lyrics and podcast information on currently playing audio. While the browsing experience is similar to iTunes, playing media on the iPad is akin to playing it on an iPhone or iPod touch. When you play a track, the iPad’s screen fills with album artwork. Artwork you’ve acquired from the iTunes Store scales beautifully, but album art you’ve downloaded yourself can look mighty pixelated if you’ve glommed on to a low-resolution image. Tap the screen and up pops basic playback controls that work just as they do on an iPhone or iPod. Additionally, you see a scrubber bar along with Repeat and Shuffle buttons (lyrics also appear if you’ve added them within iTunes and the the Lyrics & Podcast Info option is enabled in the iPod setting). The iPod app's Play screen. At the lower-left of the screen is a Back arrow icon that, when tapped, returns you to the main iPod interface, with the album artwork taking up residence in the lower-left corner. Centered beneath the artwork is a Genius button. 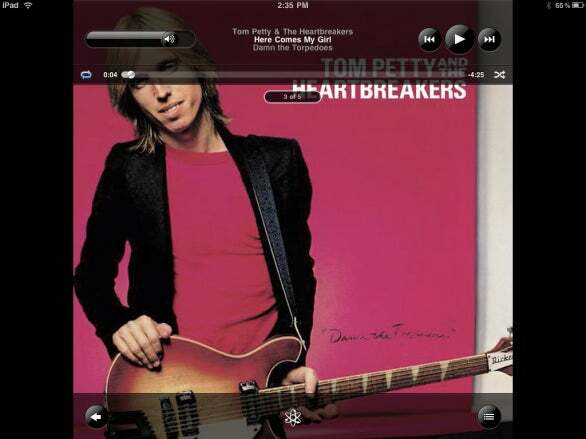 Tap it and the iPad creates a 25-track Genius playlist based on the currently playing song. To the right is a Track List button. Tap it and all the tracks in the currently playing album or playlist appear, just as they do on an iPhone or iPod touch. When playing an audiobook or podcast, tap the screen displaying the artwork and you can e-mail a link to a podcast, scrub through the audio by dragging the playhead in the scrubber bar, and change the speed of the audio (normal, double, and half speed are supported). At the bottom of these audiobook and podcast screens you find a 30-second repeat control. Tap it and the audio rewinds 30 seconds and plays. Unlike the iPhone, the iPad has no mute switch. Fortunately, it’s not difficult to silence the iPad in a hurry. Press and hold on the bottom of the volume rocker switch and the iPad’s volume rapidly drops to zero. Press and hold on the top of the switch and volume increases at a much slower rate. Like the iPhone and iPod touch, the iPad doesn’t support iTunes radio stations nor can you stream music from your iTunes library to the iPad as you can from one computer to another or to an Apple TV. The iPad app is one of the few that operates in the background. You’re welcome to dash to other parts of the iPad and the sound continues to play (it will stop playing when you sync the iPad). If you want to make a quick adjustment, just double-click the Home button. By default a mini controller appears on screen that contains buttons for back/rewind, play/pause, next/fast-forward, a scrubber bar, and Close and iPod buttons (the latter launches the iPod app). The Video app is more limited than the iPod app, largely because it’s tasked only with sorting your videos into movies, TV shows, video podcasts, music videos, and videos from iTunes U. Tap one of the buttons associated with these video types and you see the artwork associated with the movie, show, podcast, music video, or iTunes U class. Movies and TV shows you’ve purchased display only the artwork associated with them—there’s no title information so if you’re unfamiliar with the artwork or have no artwork at all, you need to tap the artwork to learn what the video is. (In our tests, homemade videos exported to iTunes from iMovie—which had no artwork embedded in them—did display the name of the movies, however.) Podcasts, music videos, and iTunes U content provide the title of the item below the artwork. You can’t rearrange the order of items on these screens but you can delete them simply by tapping and holding until you see the same ‘X’ icon as appears when removing apps, and tapping it. Movies and TV shows display no title information. 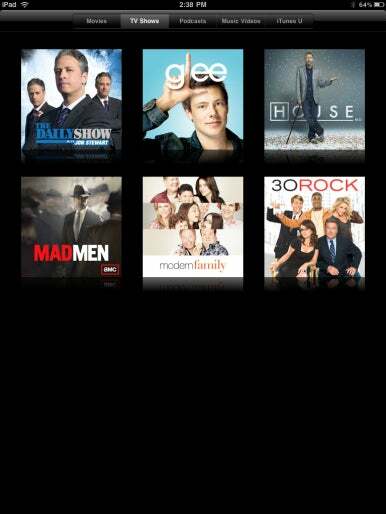 When you tap a TV show, podcast, or iTunes U icon, you’ll see a list of episodes associated with it. When you tap a movie a screen appears that provides information about the rating, studio, year made, HD or SD quality, a summary, actors, directors, producers, and, possibly, screenwriters. In this same screen you can tap a Chapters button to see any chapters the movie contains. Tap a Play button and the movie plays. When you tap a music video you may see the length of the video, its dimensions, file size, year of release, and the codecs used to process it. Again, tap the Play button and the video plays. Videos on the iPad differ from those on an iPod touch or iPhone in that they can play in either landscape or portrait orientation (on those smaller devices, they play in landscape view only). Video controls are very similar to what you find on an iPhone or iPod touch. Tap the screen and standard playback controls appear along with a volume slider. At the top of the display is a Done button and scrubber bar. Unlike with an iPhone or iPod touch, there’s no Chapter button on the video play screen. If you want to navigate through chapters you have to tap the Back button to return to the previous screen, where you can select a chapter, use the Previous or Next buttons to move back or forward through a video by chapter, use the controller on a compatible set of headphones, or use the scrubber bar to scrub to the scene you want to view. Playing a movie in the Videos app. You also find a button for toggling between widescreen and fullscreen display. Each is a compromise. When viewing videos formatted for widescreen display, when you choose the widescreen view there are large black bars above and below the video. Switch to fullscreen mode and the picture fills the screen, but you lose the some of the left and right sides of the video. If the video was originally formatted for a 4:3 standard definition, this button is missing. I tested two Apple video adapter cables with my iPad—Apple’s $49 Composite and Component AV cables. They each worked as advertised when plugged into my HDTV. There’s a measure of confusion about how the iPad handles HD content. The iPad’s display offers 1024-by-768-pixel resolution. The device can output 576p and 480p standard definition video when connected to a TV with Apple’s composite video cable and 576i and 480i standard definition video when connected via Apple’s component video cable. So where exactly does HD come in? The iPad will accept 720p video, but it won’t play it at that resolution. Nothing happens to an HD file when you sync it to the iPad from iTunes—iTunes doesn’t convert it. Rather, the iPad scales it to fit the display. That said, HD videos do look better both on the iPad and when the iPad’s connected to a TV than do standard definition videos. The iPad responds to the headphone controller found on iPhone and some iPod headphones (and headphone controllers compatible with those devices). Plug in just such a set of headphones and the iPad reacts as it should. The volume buttons work as expected. A single click on the controller commands the iPad to play. Click again and the iPad pauses. Two quick clicks and you skip to the next track or, in a movie or audiobook, chapter. Three quick clicks and you move back a track or chapter. You also use double and triple clicks to advance or retreat through podcast episodes. Although the iPad has a built-in microphone (and will record from the microphone on a compatible set of headphones), it doesn’t support the iPhone’s Voice Control feature. And that’s not surprising given that an iPad has less need of hands-free control than a pocketed iPhone or iPod touch. Portable though the iPad may be, it’s not the best portable music player Apple makes. That honor goes to the click-wheel iPod and iPod touch, thanks to their portability. The iPad is not the device you want to shove into a very large pocket to listen to music during your crowded subway commute. Because of its size and lack of voice control, it’s not an ideal audio player for the car either. And because of its weight and size, you’re not going to want to clutch it for hours while you stroll around the park. More than an iPod or iPhone, it is a suitable table-top music player, however. With its large display, a crowd can gather around an iPad connected to powered speakers or an amplifier and tap out the tunes they want to hear. (Yes, it would be cooler still if that crowd could pass around an iPad that broadcast music wirelessly, but that’s not a supported feature.) Plus, its internal speaker isn’t half-bad. It can be loud and sounds better than the typical clock radio. The iPad’s sound from the headphone port is clean and generally packs as much punch as you’ll need. The iPad is clearly a better device for viewing video than an iPhone, iPod touch, or click-wheel iPod. The screen is large enough and the off-angle viewing good enough that two people snuggled on a couch or in bed can comfortably watch a video on it. It would just as easily serve a back-seat full of kids. While you’ll have a richer audio experience using headphones or external speakers, the internal speaker will more than do in a pinch.